This paper deals with training-assisted carrier frequency offset (CFO) estimation in multiple-input multiple-output (MIMO) orthogonal frequency-division multiplexing (OFDM) systems. The exact maximum likelihood (ML) solution to this problem is computationally demanding as it involves a line search over the CFO uncertainty range. To reduce the system complexity, we divide the CFO into an integer part plus a fractional part and select the pilot subcarriers such that the training sequences have a repetitive structure in the time domain. In this way, the fractional CFO is efficiently computed through a correlation-based approach, while ML methods are employed to estimate the integer CFO. Simulations indicate that the proposed scheme is superior to the existing alternatives in terms of both estimation accuracy and processing load. Orthogonal frequency-division multiplexing (OFDM) is an attractive modulation technique for wideband wireless communications due to its robustness against multipath distortions and flexibility in allocating power and data rate over distinct subchannels. For these reasons, it is adopted in a variety of applications, including digital audio broadcasting (DAB), digital video broadcasting (DVB), and the IEEE 802.11a wireless local area network (WLAN) . Combining OFDM with the multiple-input multiple-output (MIMO) technology is an effective solution to increase the capacity of practical commercial systems. The deployment of multiple antennas at both the transmitter and receiver ends can be exploited to improve reliability by means of space-time coding techniques and/or to increase the data rate through spatial multiplexing . Similar to single-input single-output (SISO) OFDM, MIMO-OFDM is extremely sensitive to carrier frequency offsets (CFOs) induced by Doppler shifts and/or oscillator instabilities. The CFO destroys orthogonality among subcarriers and must be accurately estimated and compensated for to avoid severe error rate degradations . While CFO recovery is a well-studied problem for single antenna systems, only few solutions are available for MIMO-OFDM. A blind kurtosis-based scheme is presented in , while a method for jointly estimating the CFO and MIMO channel is derived in  by placing null subcarriers and pilot tones across adjacent OFDM blocks. Unfortunately, these methods are quite complex as they require a large-point discrete Fourier transform (DFT) operation and a computationally demanding line search. Furthermore, they provide the CFO estimate upon observation of several OFDM blocks, and accordingly, are not suited for packet-oriented applications, where synchronization must be completed shortly after the reception of a packet. In order to achieve fast timing and frequency recovery, training sequences with a periodic structure are commonly employed in SISO-OFDM systems [6–8]. Extending this approach to MIMO-OFDM, however, is not straightforward as signals emitted from different antennas give rise to multistream interference (MSI) at the receiver station, which may degrade the accuracy of the synchronization algorithms. The detrimental effect of MSI can be alleviated by a careful design of the MIMO preambles. For instance, in , it is shown that the performance of the least-squares (LSs) channel estimator is optimized if the training sequences at different TX branches are orthogonal and shift-orthogonal for at least the channel length. To meet such requirement, a time-orthogonal design is employed in , where different TX antennas transmit their preambles over disjoint time intervals. In this way, however, the preamble length grows linearly with the number of TX branches, thereby, increasing the system overhead. The use of chirp-like polyphase sequences is suggested in , while a training block composed of repeated PN sequences with good cross-correlation properties is employed in . In both cases, the CFO estimate is obtained by cross-correlating the repetitive parts of the received preambles in a way similar to SISO-OFDM. This approach is also adopted in [13, 14], where the pilot sequences are obtained by repeating Chu or Frank-Zadoff codes with a different cyclic shift applied at each TX antenna. Alternative criteria for MIMO-OFDM preamble design can be found in [15, 16]. 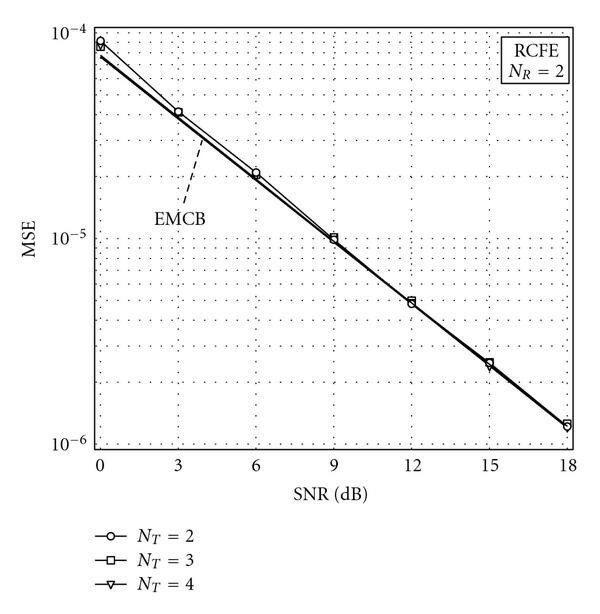 A subspace-based method for CFO estimation in MIMO-OFDM has recently been proposed in . In this scheme, pilot symbols at different transmit antennas are frequency-division multiplexed (FDM) and placed over equally spaced subcarriers. The resulting preambles are characterized by an inherent periodic structure in the time domain which can be effectively exploited at the receiver to separate signals arriving from different TX antennas. This approach is reminiscent of the multiple-signal-classification (MUSIC)-based frequency recovery scheme employed in  in the context of orthogonal frequency division multiple access (OFDMA). The main advantage with respect to  is that in , the CFO estimate is obtained with reduced complexity by looking for the roots of a real-valued polynomial function. A root-based approach is also adopted in  after writing the CFO metric in polynomial form. In this paper, the repetitive slots-based CFO estimator discussed in  is extended to MIMO-OFDM transmissions. In order to enlarge the frequency acquisition range, however, we decompose the CFO into a fractional part plus an integer part. The fractional CFO is computed first by cross-correlating the repetitive segments of the received preambles in a way similar to , while the integer CFO is subsequently estimated by resorting to maximum likelihood (ML) methods. This results into an algorithm of affordable complexity which can estimate large CFOs and whose accuracy attains the relevant Cramer-Rao bound (CRB). The rest of this paper is organized as follows. Section 2 describes the system model and introduces basic notation. In Section 3, we review the joint ML estimation of the CFO and MIMO channel, while Section 4 is devoted to the training sequences design and CFO recovery scheme. Simulation results are presented in Section 5 and some conclusions are drawn in Section 6. Notation 1. Matrices and vectors are denoted by boldface letters, with and being the DFT matrix and identity matrix of order , respectively. denotes an diagonal matrix with entries along its main diagonal, while is the inverse of a square matrix . We use , , , and for expectation, complex conjugation, transposition, and Hermitian transposition, respectively. The notation represents the Euclidean norm of the enclosed vector, while e , and stand for the real part, modulus, and principal argument of a complex number . Finally, denotes the ( )th entry of a matrix while is a trial value of the unknown parameter . where is a power of two not smaller than , are integer parameters satisfying and are pilot symbols with constant modulus . In this way, the total energy allocated to training amounts to and is equally split between the TX antennas. In the sequel, we refer to (7) as the maximum likelihood frequency estimator (MLFE). The following remarks are in order. each vector ?? ( ) of time domain samples is obtained by the repetition of identical segments, where is some power of two. Condition C1 implies that the preambles remain shift-orthogonal in the time domain, which is desirable to enhance the accuracy of the channel estimates, while condition C2 facilitates CFO recovery by ensuring that the preambles are periodic with period . where we set to ensure that the total energy allocated to training is still . It is worth observing that the use of time-repetitive FDM training sequences for MIMO-OFDM has also been suggested in  to make the CRB of the frequency estimates independent of the channel realization. However, our design (14) is more general as it applies to any triple whereas in , the number of subcarriers is constrained to be a multiple of . Recalling that in practical OFDM systems is always a power of two, it turns out that the sequence design in  can only be adopted on condition that both and are powers of two. while are statistically independent Gaussian vectors with zero-mean and covariance matrix . If the normalized CFO is guaranteed to be less than in magnitude, the quantity can be regarded as an estimate of . Otherwise, is expressed as in (15), and an estimate of the integer offset must be found. This problem is now addressed using ML methods. In the sequel, we refer to (35) as the reduced complexity frequency estimator (RCFE). (1) As mentioned previously, matrix in (28) is nonsingular provided that . Such condition is more restrictive than the constraint that was found in the previous section for MLFE. In particular, recalling that , it turns out that the maximum channel length that RCFE can manage is times smaller than for MLFE. (3) The computational load of RCFE can be assessed as follows. Computing the correlations in (19) requires a total of real operations (additions plus multiplications) for each RX branch, while operations are needed to obtain in (23). Quantities in (33) are computed through an -point DFT for each receiving antenna, with a corresponding complexity of . Finally, evaluating in (34) needs additional operations for each . The overall complexity of RCFE is summarized in the first row of Table 1, where a distinction has been made between the FCFO and ICFO recovery tasks, and we have denoted by the number of hypothesized ICFO values. Complexity of FCFO and ICFO estimation schemes . Comparing this results with (38), we see that the loss (in dB) with respect to RCFE is Log , which approaches 1.25 dB for large values of . Furthermore, since no ICFO estimation is attempted in , the estimation range of CBFE is restricted to , while RCFE can cope with CFOs as large as . The overall complexity of CBFE is shown in the third line of Table 1. Compared to FCFO recovery by means of RCFE, the computational saving of CBFE is in the order of . Computer simulations have been run to check and extend the analytical results of the previous sections. The simulation scenario is summarized as follows. In (41), the constant is chosen such that the channel power is normalized to unity, that is, . A new channel snapshot is generated at each simulation run and kept fixed over the training period. Vectors are assumed to be statistically independent for different TX/RX antenna pairs. The training sequences employed by RCFE are given in (14), where we have set and . In this way, each TX antenna transmits a total of 32 pilot symbols which are randomly taken from a QPSK constellation with power . Parameters and are varied throughout simulations to assess their impact on the system performance. over the set , with being the -point DFT of . After ICFO compensation, the fractional CFO is eventually estimated by looking for the roots of a real-valued polynomial function that is obtained by applying the MUSIC principle. As mentioned in , the estimation range of PBFE is . Its computational requirement is mainly ascribed to the need for evaluating the correlation matrix of the received time domain samples and is summarized in the second row of Table 1. 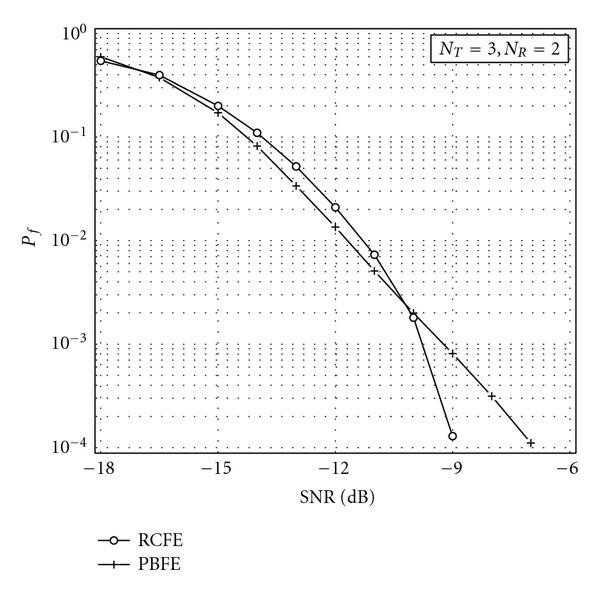 Figure 1 compares the performance of the fractional CFO estimators in terms of their MSE versus the signal-to-noise ratio at each receiving antenna. The latter is defined as SNR , where is the noise power, and is given in (37). Marks indicate simulation results, while solid lines are drawn to ease the reading of the graphs. The number of TX and RX antennas is and , respectively. The same training sequences are used for both CBFE and RCFE, while PBFE employs the pilot design specified in (4) with and . This means that the number of pilot symbols transmitted by each TX antenna is 32 for all the considered schemes. As suggested in , the pilot symbols for PBFE belong to a Chu sequence. The CFO is randomly generated at each simulation run with uniform distribution within the interval , which corresponds to having and . For the time being, we concentrate on the accuracy of the FCFO estimates and assume ideal ICFO recovery for both RCFE and PBFE. We use the average CRB to benchmark the performance of the considered schemes. The latter corresponds to the extended Miller and Chang bound (EMCB)  and is obtained by numerically averaging the right-hand-side of (12) with respect to the channel statistics. Inspection of Figure 1 reveals that RCFE outperforms the other schemes, and its accuracy is close to the EMCB at all investigated SNR values. As predicted by the theoretical analysis shown in (38) and (40), the loss of CBFE with respect to RCFE is approximately 1.25 dB. Looking at the system complexity, from Table 1, it turns out that in the considered scenario, RCFE requires a total of 57 500 operations for FCFO recovery, while PBFE and CBFE need 1 156 000 and 24 000 operations, respectively. 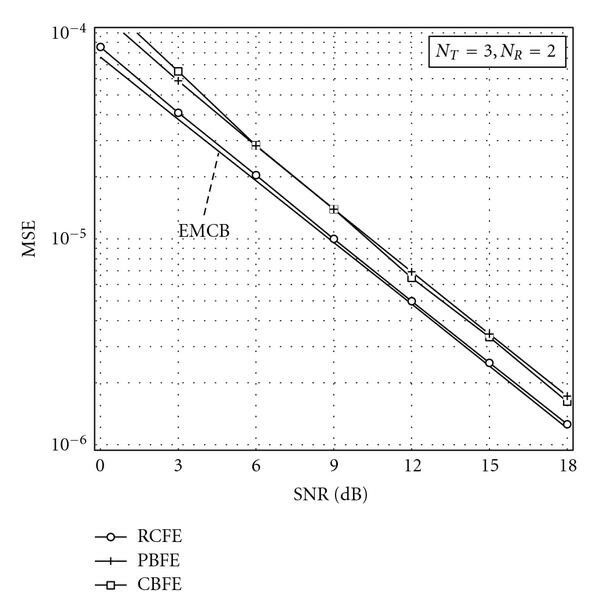 Combining these figures with the results of Figure 1 indicates that RCFE is superior to PBFE in terms of both estimation accuracy and processing load, while CBFE is a valid solution when limiting the computational requirement is an issue of concern. MSE of the FCFO estimators versus SNR with = 3 and = 2. Figure 2 illustrates the impact of the number of transmit antennas on the accuracy of RCFE. The simulation scenario is the same as in Figure 1, except that now or . As it is seen, the frequency MSE is virtually independent of and the same occurs for the EMCB. Such behavior can be ascribed to the fact that signals emitted by different TX antennas combine incoherently at each RX branch, so that higher values of do not result into a corresponding increase of the array gain. As it is known, array gain exploitation by means of multiple TX antennas requires channel knowledge at the transmitter in conjunction with suitable precoding techniques. Accuracy of RCFE versus SNR with = 2, 3, 4 and = 2. 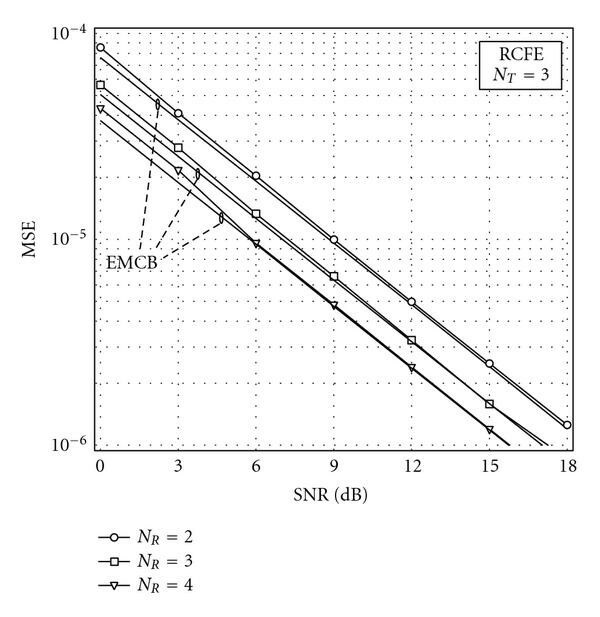 Figure 3 shows how the performance of RCFE is affected by the number of receiving antennas. In such a case, is fixed to three while or . As predicted by (38), the estimation accuracy improves with and this trend is also evident in the EMCB. The physical reason behind such SNR advantage is that the presence of multiple receiving antennas increases the length of the data record used for CFO recovery. This provides the system with an array gain of Log( ) dB. Accuracy of RCFE versus SNR with = 3 and = 2, 3, 4. The performance of the ICFO estimators is illustrated in Figure 4 in terms of probability of failure versus SNR. Comparisons are made between RCFE and PBFE using the same simulation setup of Figure 1. The RCFE metric defined in (34) is evaluated for , while PBFE looks for the maximum of over the set . In this way, the estimation range is for RCFE and for PBFE. As it is seen, for SNR dB, the best performance is obtained with RCFE. From Table 1, it follows that the total number of operations needed to get the CFO estimate is 1 283 000 for PBFE and 252 500 for RCFE, thereby leading to a reduction of the processing load by a factor greater than 5. It is fair to say, however, that the complexity of PBFE can be controlled by a judicious design of parameter . Specifically, decreasing alleviates the computational requirement at the expense of a reduced CFO acquisition range. Probability of failure versus SNR for RCFE and PBFE with = 3 and = 2. We have addressed the problem of training-assisted CFO recovery in MIMO-OFDM systems. To reduce the computational burden required by the exact ML solution, we have divided the CFO into a fractional part plus an integer part and have designed FDM pilot sequences that are periodic in the time domain. The fractional CFO is estimated in closed form by measuring the phase rotations between the repetitive parts of the received preambles, while the integer CFO is estimated in a joint fashion with the MIMO channel matrix by resorting to the ML principle. The proposed scheme has affordable complexity and exhibits improved performance with respect to existing alternatives. For these reasons, we believe that it provides an effective approach for frequency synchronization in beyond third generation (3G) wideband MIMO-OFDM transmissions.